Lately I’ve become a bit obsessed with curry, cumin, garam masala, etc. Below is my Mediterranean inspired pizza on naan bread and seasoned with curry and cumin. It is a white pizza and that means it’s not too terrible for you!! Especially because I made the “sauce” with plain Greek yogurt and fresh herbs. Preheat oven and cookie sheet (or if you’re fancy enough to have a pizza stone), to 450°. Mix together all ingredients for sauce and taste for seasoning. In a nonstick skillet, add olive oil, fennel and some salt and pepper. Cook on medium heat for 4 minutes. Remove from pan. Add pepper to remaining oil and season again with salt and pepper. Cook for another 4 minutes. Remove from pan. Brown Turkey in remaining oil. Add salt, pepper, curry and cumin powder halfway through the browning process. Cook until desired colored is achieved. (I like mine with some tooth so I cook for about 10-12 minutes until I have a lot of brown delicious bits). Remove from pan. Assemble! Add sauce to the naan bread, spread evenly. 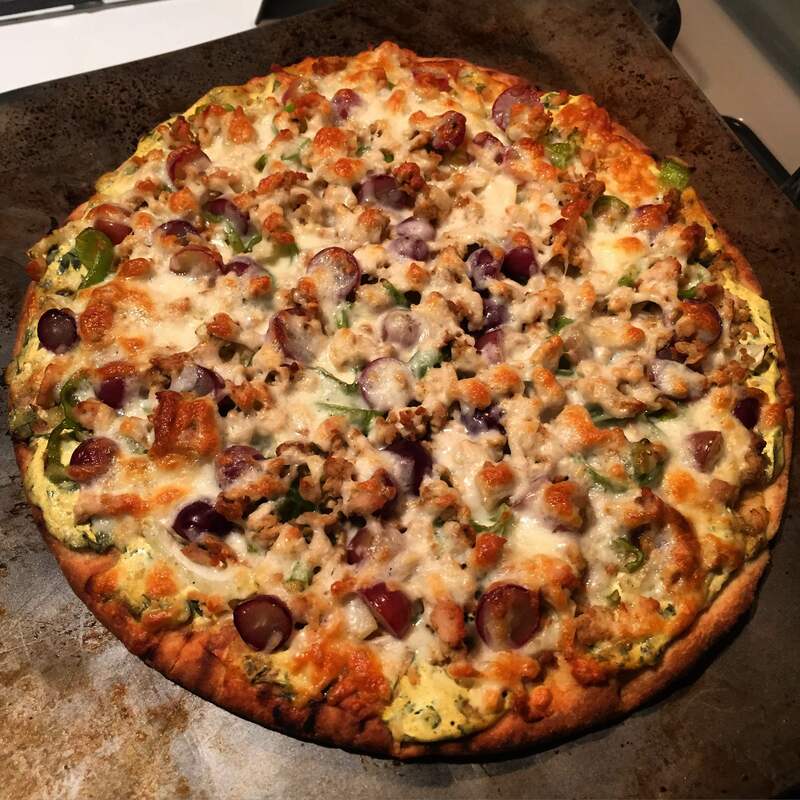 Top with fennel, peppers, grapes, ground turkey and cheese. Bake for 8-10 minutes or until the cheese is cooked to your liking. Let rest 5-10 minutes before cutting into the pizza.